New Delhi– Declaring that Indian entrepreneurship needs to be promoted in global electrical industry, Power Minister Piyush Goyal on Wednesday said though foreign technology is welcome in India, the overall aim is to strengthen Indian manufacturing. “We welcome technology from all around the world but at the end of the day, we would like to strengthen our Indian hands,” Goyal said at the launch of the Light India Exhibition 2016 here. “I am happy to have imports come in, if we are at level playing field. But if we find that other countries are dumping goods into India, certainly that is not welcome in the country,” the Minister said. He lauded the innovative concepts like solar street lights on display at the exhibition. 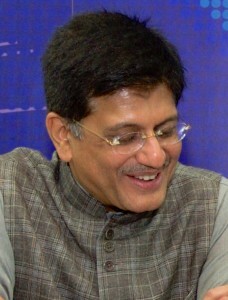 “I can actually imagine putting up not less than 10 or 15 million solar street lights, particularly in rural areas,” Goyal said. “The industry is reinventing itself and I saw some very new products here and would like to initiative talks for bulk orders,” he added. Over 275 companies are showcasing intelligent technologies at this electrical building technology exposition.